I’ll get what’s going on with me in a bit, but right now I want to put the focus squarely on the WesFest 10 Benefit Concert, featuring Victor Wooten, happening on Sunday, March 8 in Los Angeles. Longtime BellerBytes followers already know about my deep commitment to this cause - The Wes Wehmiller Scholarship at Berklee College Of Music – but for anyone new, Wes Wehmiller was a world-class bassist and dear friend of mine who passed on in 2005 at the too-young age of 33. His parents established the Wehmiller Scholarship at Berklee in his name, and the award goes to a deserving continuing bass student at Berklee who embodies Wes’ spirit both musically and personally. The WesFest benefit concert serves as the centerpiece of an annual fundraising drive for the event. Past headliners have included Allan Holdsworth/Jimmy Haslip, Tal Wilkenfeld, The Aristocrats, Brendon Small’s Galaktikon, Mike Keneally, Stu Hamm, Andrew Gouche, Pino Palladino and John Patitucci. I was honored to be a part of the organizing team for the event’s first 8 years, and the initiative has now rasied over $200,000 since its inception. I know I speak for the family and everyone involved when I say we’re all so grateful for the support we’ve received that it’s hard to know how to express it. This year is extra special because it’s the 10th anniversary of the event, and we have the one and only Victor Wooten (featuring Steve Bailey and other special guests) as our headliner. Also performing will be Mike Keneally and Beer For Dolphins (I’m playing with Mike! ); Danny Mo and The Exciters (featuring JR Robinson and Kira Small), and as always, this year’s scholarship winner (Stefan Sandman) will be flown out from Boston to perform at the event, so donors can see and hear exactly what they’re supporting with their generous donations. Though I wasn’t part of the core organizing team this year (that credit goes elsewhere! ), I will be the M.C. for the evening. If you’re in Los Angeles on Sunday, March 8, I invite you to come down and see for yourself what’s made this event so musically and spiritually special for ten years and counting. I have yet another uncharacteristically altruistic topic to discuss in this week’s BellerBytes, and I appreciate your indulgence in advance: A couple who is extremely close and dear to me is looking to adopt a baby. I know this is a totally out-of-left-field topic, but with me having this embarrassing number of folks following what I’m up to, they’ve asked for my help in spreading the word, and it’s my privilege to do so. I wouldn’t be doing this if I didn’t know them to be exceptional parents (two kids already, one adopted) and stellar humans. So, with that in mind, I’m asking you to please read their own words below (from their website) and to contact them (either call 888-624-7771 or text 917-636-9763) if you might know of someone considering adoption. Hello! We are a caring, warm and fun couple who have been married for 12 years. Laurie is a stay-at-home mom and Lawrence has a successful career in financial services. We live in a beautiful neighborhood in New York City with our 9-year old daughter and 3-year old son (who was adopted) and we want to grow our family with another adopted baby. Our favorite things to do are: explore New York City’s fantastic parks, museums and zoos, take family vacations – especially to Disney World and lots of beaches! – and spend relaxing Sunday mornings together playing board games and doing art projects. We cannot think of a greater gift than the one you are considering. Adoption has already changed our lives. At the same time, we can only imagine how overwhelming this decision must be for you. We hope this site helps you get to know us better as a couple and a family, and how much we would love and cherish your child. We’d love to talk to you, and we can be reached at 888-624-7771. * The Aristocrats - the band I’m in with Guthrie Govan and Marco Minnemann - just spent 10 days tracking a new record at the legendary Sunset Sound studio in Hollywood, CA. I am here to tell you that it was by far the most rewarding recording experience I’ve ever had. Every day we were there, we uncovered another layer and found another reason why the room we were in (Studio 2) was so great. The combination of great vintage gear, the famous reverb chambers (the ones that were used for the early Van Halen albums), and the room sound in the main tracking room all contributed to an environment that encouraged maximum creativity and made us sad to leave. I personally can’t believe how good the rough mixes sound…and as for the material, it’s like nothing we’ve ever done, and we all went for broke in terms of layering the recordings to our heart’s content. The result is a totally new direction for the band, and we all feel like giddy schoolchildren right now. I can’t wait to share this record with you. It drops in late June (exact date TBD) and a U.S. tour immediately follows. One of the reasons it went so well is that we played the material live at Alvas Showroom for four nights in a row before we went into the studio. That was a really great experience – thanks so much to the fans who came out to watch us (nervously!) play our new babies for the first time. Thanks also to Alvas for hosting the event. Here’s a couple of pix from Alvas and the studio for your amusement. 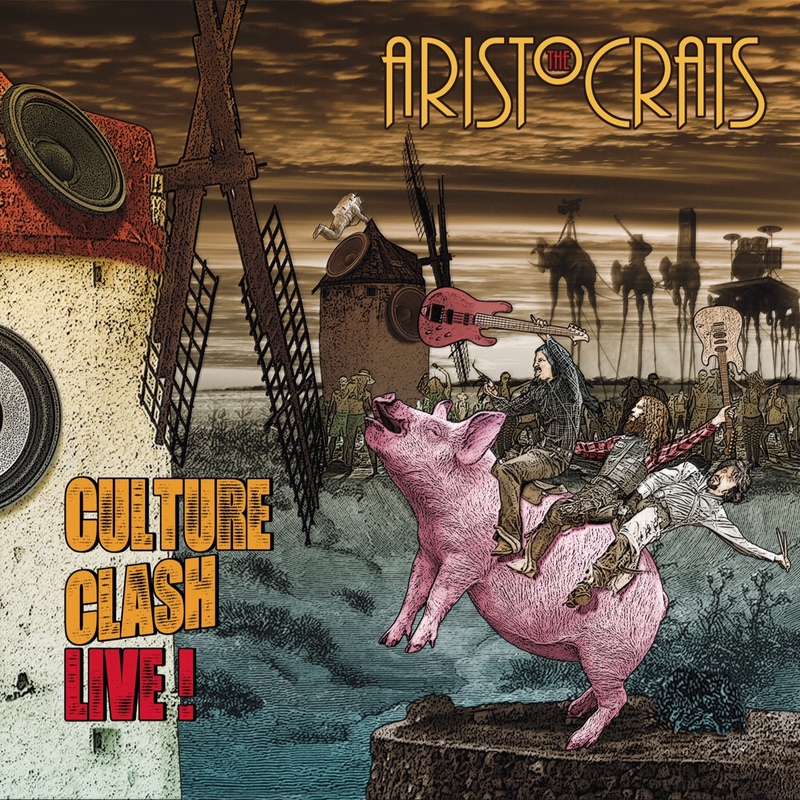 * Speaking of The Aristocrats, our new live CD/DVD Culture Clash Live (and the limited-edition Secret Show: Live In Osaka) is now out and available for immediate ordering. Lots of people have been kind enough to tell us they dig it, but none more elegantly than the website Echoes And Dust, who really got the cheekiness of it all and compared us to a “charging rhino in a pink tutu.” That’s what we call high praise. Click here to check out previews on our YouTube page, or just click here to order. If you’ve already got it, thanks so much for your support and hope you like it! * I also recently had the privilege of tracking Joe Satriani’s new album, which is due to drop in September. We did it at Skywalker Sound, George Lucas’ expansive compound which contains multitudes, including an incredibly large tracking room. It was another “pinch me” experience, and I’m very grateful to Joe for letting me contribute to his recording. I really dig the material and hope you will too. Here’s a shot of the room at Skywalker that we lived in for a week. Not bad. Well. That was a lot of information, so I’ll stop now. Hope you’re all doing well – and if you’re on the east coast, I’m sending as much California sunshine your way as I can.